Would you know what to do if someone overdosed? The Health Department offers FREE life-saving Naloxone (Narcan) training for residents. When administered correctly, the nasal spray Narcan restores breathing that has been dangerously slowed by an overdose of heroin or prescription painkillers. Narcan can work within a minute or two, giving emergency responders time to get the person to a hospital. Residents who participate in the free trainings learn how to administer Narcan. Residents who do not have health insurance, will receive a free Narcan kit. Residents who have health insurance will be instructed on how to obtain a kit at a participating pharmacy through their health insurance. Residents 18 years of age or older who want to be trained to administer Naloxone (Narcan) should register online for the training dates listed below.Register early as space is limited. Naloxone is a life-saving drug that can revive overdose victims. Its brand name is Narcan. Naloxone (Narcan) helps restore breathing to a person who is overdosing from opioid drugs such as heroin and prescription drugs such as oxycontin, oxycodone and fentanyl. It also is used to reverse the effects of narcotic drugs used during surgery and to treat pain. How is Naloxone (Narcan) administered? 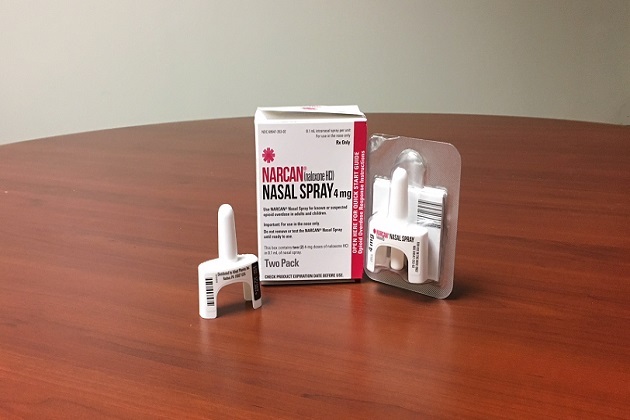 Westchester County Department of Health offers trainings on how to administer Narcan through a nasal spray. In a clinical setting, Narcan can be injected intravenously. How do I find out more about Naloxone (Narcan) trainings for Law Enforcement and First Responders? Local police departments and first responders interested in arranging a training can contact the Westchester County Department of Health at (914) 995-6588. How do I find out more about Naloxone (Narcan) trainings for residents? The Westchester County Department of Health offers free Community Opioid Overdose Trainings. Trainings are comprised of a PowerPoint presentation (current as of 3/2019), as well as a hands on demonstration to ensure that participants are able to administer Narcan. Residents who do not have health insurance, will receive a free Narcan kit. Residents who have health insurance will be instructed on how to obtain a kit at a participating pharmacy through their health insurance. All participants will be certified to administer Narcan for two years in New York State. Can I request training for my organization or agency? If your organization or agency is interested in arranging a training, please call the Division of Health Promotion at 995-6584. How do I find out about other Naloxone (Narcan) trainings available in the community? Residents can learn about additional trainings held in the Lower/Mid-Hudson Region by visiting the NYS Department of Health's Community Calendar of Opioid Overdose Trainings. Will I get in trouble if I report an overdose? Many overdose deaths can be prevented if emergency medical responders are notified. However, people using drugs illegally often fear police involvement and arrest if they call 911. To protect people from arrest and prosecution, New York State provides limited immunity from arrest or prosecution for minor drug and alcohol law violations for people who seek help at the scene of an overdose. For more information on the Good Samaritan Law, also known as the Fatal Overdose Prevention Law, visit 911 Good Samaritan Informational Brief. What should I do if suspect an overdose? Call 911 if you suspect an overdose, and seek medical attention even if Naloxone (Narcan) has been used. The effects of Naloxone (Narcan) can wear off and the effects of the overdose drug can return in 30 to 90 minutes. How can I safely get rid of prescription drugs that I have at home? Unwanted or expired medications can be disposed of safely, conveniently and confidentially at lockboxes located at many police departments throughout the county. Medications, in both liquid and pill form, can be brought to participating police departments. Westchester residents can also bring medications in their original container or a sealed plastic bag to the county Household Materials Recovery Facility in Valhalla. All prescription and over-the-counter medications are accepted once a month, and residents simply drive and drop them off without having to leave their car. For more information, call (914) 813-5425. Can I get Naloxone (Narcan) at a pharmacy without a doctor’s prescription? Naloxone is now available without a prescription at many pharmacies throughout New York State. In August 2017, New York State launched the Naloxone Co-Payment Assistance Program (N-CAP). This pharmacy benefit program is available to all New Yorkers who have prescription coverage through their health insurance plans. The N-CAP program covers co-payments for naloxone in an amount up to $40 for each Naloxone prescription dispensed. For a list of pharmacies participating in the N-CAP program, downlad the NY State DOH's Directory of Pharmacies Dispensing Naloxone with Standing Orders. For individuals who would like to purchase Naloxone without using their health insurance, it may be purchased for full price at many pharmacies. If you do not have insurance, free Narcan kits can be obtained through a community training with the Westchester County Department of Health.